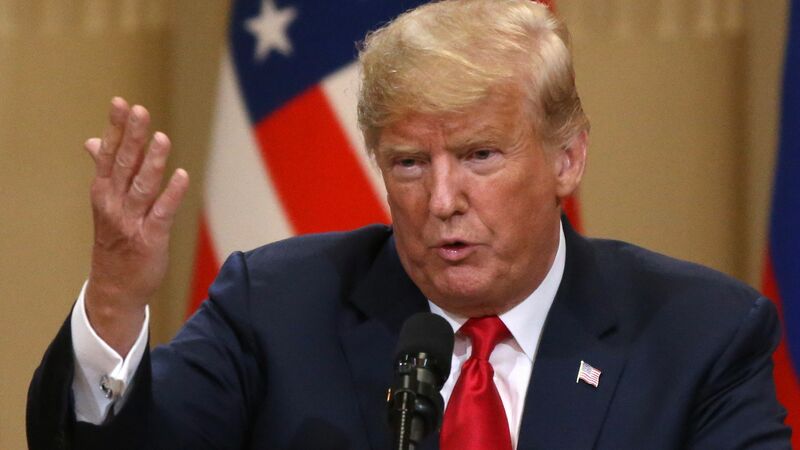 President Trump on Monday softened U.S. criticism toward Russia's planned Nord Stream 2 natural gas pipeline to Germany, signaling a public break with the years-long State Department position that the proposed project is a threat to European energy security. The bottom line: Instead Trump cast the project in market competition terms, touting the prospect of U.S. gas exports taking on Russian gas and playing a larger role serving European markets. Why it matters: Trump's comments, which followed his meeting with Russian President Vladimir Putin, are another example of the president's message straying from existing U.S. policy and at times differing from other parts of his own administration. They also represent a shift in tone from Trump, coming just a week after he slammed Germany over the project, alleging the U.S. European ally is "captive" to and will be "totally controlled" by Russia. What he said: "We will be competing when you talk about the pipeline. I am not sure, necessarily, that it’s in the best interests of Germany or not, but that was a decision that they made. We will be competing," Trump said, standing next to Putin after their meeting in Helsinki, Finland. "As you know, the United States is now, or soon will be, but I think it actually is right now the largest in the oil and gas world, so we are going to be selling LNG and we will have to be competing with the pipeline, and I think we will compete successfully, although there is a little advantage locationally." The intrigue: Trump's comments casting the U.S. as a commercial competitor to Russia differ from the State Department's repeated and more pointed critiques of the project on European security grounds. A State official noted to Axios last week that the pipeline is "diversionary" — that is, re-routes existing flows through Ukraine — and hence stopping it would not open new U.S. LNG markets. "U.S. LNG can play a role in EU energy diversification, but will need to compete with LNG from other global suppliers in a market context," the official said last week. Putin's stance: The Russian leader rebutted criticism of the project, and signaled that it came up in his discussion with Trump. Be smart: It's not clear whether the U.S. will become a major LNG exporter to Europe, and Asian markets and Mexico have been much larger export destinations from growing volumes leaving U.S. shores. However, the U.S. can still exert leverage in Europe by becoming another supply option, some experts say. "U.S. natural gas can dampen Russia’s geopolitical influence and economic rents as long as it poses a credible threat to Russian gas," writes Anna Mikulska, an expert in Russian and European energy, in a post on the website The Conversation a few days ago.